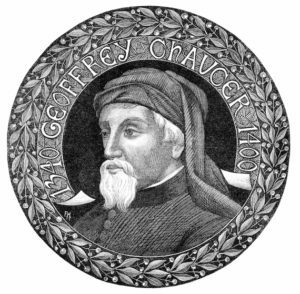 Geoffrey Chaucer, an accountant, had the good luck to marry the sister of the mistress of John of Gaunt. And John of Gaunt’s father was the King of England. 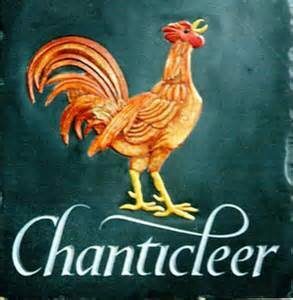 To impress his high-born friends, Chaucer started writing what we would call dirty stories. They were impressed. 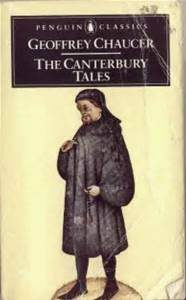 Chaucer found a way to link his stories together – a pilgrimage to Canterbury Cathedral! In The Miller’s Tale, a young wife and her lover raise the old husband up to the ceiling in a tub, after convincing him another Noah’s flood is coming, so they can make love in the bed under the now suspended husband. In another, The Nun’s Priest Tale, a rooster with attitude gets tricked by a fox. The tale was written in 1392 to commemorate a royal anniversary on a date said to be “the 32nd of March.” Well, that would be a trick done on April 1st, wouldn’t it? But the idea may be much, much older: Hilaria. Romans celebrated this day, the Spring Equinox, with a day of games and fun where no sadness or seriousness was allowed. And that was an idea they borrowed from the Greeks. 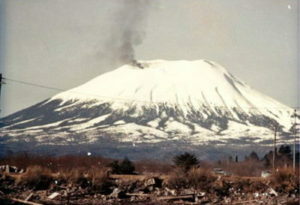 Today, major news outlets are not above playing jokes, from an iceberg in Australia to an exploding dormant volcano in Alaska to magical color TVs in Sweden to spaghetti trees. 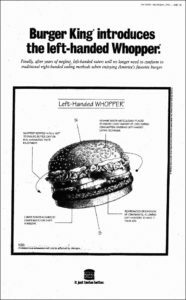 On April 1st, 1998, Burger King ran an ad announcing “the left-handed Whopper.” One clever newspaper article spelled out Happy April Fool’s Day with the first letter of every word in the article. So Happy April Fool’s Day! As for Chaucer, on his death bed, he begged that all his writing be destroyed. Finally Food for Lefties. The left-handed Whopper.